We all dream of being famous footballers. The money, the lifestyle, the ability to spend your life on instagram saying ‘you love this game’. It really is the dream, that’s before even stepping out onto the pitch. We’ve all heard that the likes of Gordon Ramsey could have made it, although the amount of bookings he’d receive for descent would have likely seen him on permanent suspension, while the likes of Paolo Maldini and Grant Holt have also turned their hand following a football career, the latter of which is bursting onto the wrestling scene. 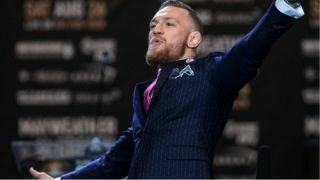 Conor McGregor most certainly doesn’t need the money of a footballer and he’s about to earn even more when UFC 229 arrives in just a few weeks time. It’s all set to be an historic encounter and one of the most watched in UFC history. You can find out more about watching the fight with this guide, but perhaps more interestingly, you’ll be intrigued to hear about a promising amateur football career. He’d line up regularly for Slieveamon United and Yellowstone Celtic in his native Ireland and even described himself as a goal machine. A label also backed up by his former coach. Though, who’s going to argue? Beefy went one step further and actually became a professional sportsman in both football and cricket. Best known as one of the finest all-rounders England has ever produced, Ian Botham split his time between playing for Somerset and the Three Lions and Scunthorpe United, where he is now a club president. He only played 11 games for The Iron in the Football League and was always thought of as a promising centre half. His work with the bat was always his preference though and we’re perhaps all better off for him choosing leather on willow over the brutal sound of studs running down a shinpad. If Boris Becker had become a footballer, we’d imagine he’d have certainly beaten Jurgen Klinsmann to his trademark celebration. He’s famously a huge Bayern Munich fan and is even on the board of directors at the club. He also played regularly as a youngster before having to give it up to become a Wimbledon champion. The German was said to have been able to go pro had he kept it up. To this day he’s still football crazy, so much so he’s even taken on pundit work in his home nation. The Wolf perhaps isn’t necessarily a sport star, but who can deny that Gladiators got the blood pumping. A frightening prospect at the NIA in Birmingham, we wouldn’t have liked to line up against him on a football pitch. The Reserves of Cambridge United had to do exactly that though back in 1994, when the Wolf walked out to face them for Gillingham. He played 73 minutes for the club before going off injured. Perhaps a little revenge for all the poundings he gave those poor accountants trying reach the top of the wall.